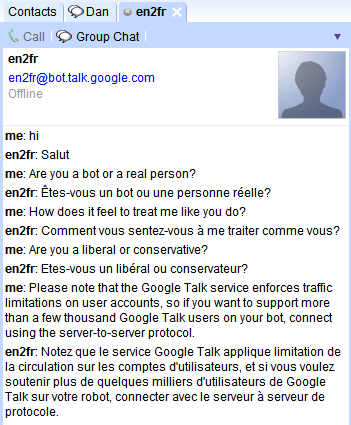 While this is a great interface for translating short texts (you can access Google Talk from Gmail, from google.com/talk or in many other ways), you can also use the bots to translate conversations in real-time. You need to invite the two corresponding bots in a group chat, so this doesn't work in the desktop client, which still does not support group chats. For some reason, when I invited one of the bots, it was offline, but it still translated my messages. It would be great if Google adds this as a standard feature of Google Talk and you only need to enter your native language, but the translation quality is not that great and it could cause problems in some situations. The good news is that Google's statistical translation system advances really quickly and you'll see more and more languages pairs in the future. Any idea how fast the quality of google's machine translation is advancing? That would make a nice follow-up post to the one you linked to. It's difficult to evaluate a translation system, but we can still look at some simple examples. Someone who speaks French well can compare the translation from this screenshot taken in October with the current translation (the original text is from a CNN article). "Alimentée par venteux, chaud et sec, plus d'une douzaine de fuites non incendies de forêt fait rage à travers fortement peuplées sud de la Californie, le lundi, forçant plus d'un quart de million de personnes à fuir les maisons qui s'étend de San Diego à la vedette de cinéma hameau de Malibu et le Pittoresque station de montagne de Lake Arrowhead." I think Google is doing a much better job. Great work they did there. I think this is a pretty cool feature. I work regularly with European partners and we communicate in English. A feature like this could help bridge a language barrier. Unfortunately from a work privacy point of view, we would never use this service unless it was internal. uk2en, en2uk (Ukrainian<->English) do not answer char invitations - are they available? I really LOVE gmail and Google Talk....You guys rock!!!! I'm very interested in some of them. There are 26 new bots: bg2en, cs2en, da2en, en2bg, en2cs, en2da, en2fi, en2hi, en2hr, en2no, en2pl, en2pt, en2ro, en2sv, en2zh-hant, fi2en, hi2en, hr2en, no2en, pl2en, pt2en, ro2en, sv2en, zh-hant2en, zh-hant2zh, zh2zh-hant. Here's the complete list.